This paper presents part of the work performed within a project supported by "Réseau Génie Civil & Urbain". The project aims to assess the contribution that can be expected from the combining of several non-destructive techniques for cover concrete sounding. 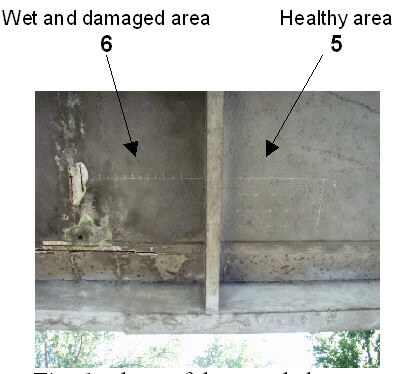 Investigations were carried out on a Bow-String bridge in Toulouse (France), which presents damage of the cover concrete such as cracks or delaminations resulting from corrosion of the reinforcement, structural faults or under-design. The NDT techniques used were radar by analysis of direct waves, the capacitor method, half-cell potential, infrared thermography and the propagation of acoustic surface waves. The first contribution of the in-situ measurements was to clarify some limits of the techniques in a real situation, like the influence of environmental or edge and scale effects. The knowledge of these limits will be very helpful for the validation of the sounding methods. Nevertheless, the interest of combining radar and capacitor measurements has been highlighted. Indeed both of them allow moisture gradients to be distinguished at the surface of cover concrete. Moreover the results obtained with these two techniques correlate well with half cell potential measurement, which is of great interest for the detection of areas with high probability of corrosion. In France, as in other countries, a lot of bridges are reaching an age where repairs are necessary. A rationalised schedule for these repairs is essential to minimise traffic obstruction so the development of non-destructive methods of sounding, applied to civil engineering structures, presents an increasing interest for their managers. Indeed these methods can quickly provide detailed data at reasonable cost. The quality of the cover concrete is implicated in most of the damage observed on reinforced or prestressed concrete structures. In a diagnosis process its evaluation by non-destructive techniques should be considered as an important stage. This paper introduces part of the work done within a project supported by "Réseau Génie Civil & Urbain". A combination of several non-destructive methods for cover concrete sounding is the basis of this project. Investigations were carried out on a Bow-String bridge in Toulouse (France), which presents several types of degradation. Most of them are damage of the cover concrete (cracks, delamination, etc.) resulting from corrosion of the reinforcement, structural faults or under-design. The techniques implemented were radar by analysis of direct waves, the capacitor method, infrared thermography and propagation of acoustic surface waves. One of the main parameters, which is very useful for the diagnosis of cover concrete, particularly for corrosion evaluation, is moisture content. So, it is desirable to develop some non-destructive tools for the evaluation of this parameter. In this paper, we present the combination of two non-destructive techniques, radar and the capacitor method, the sensitivity of which to moisture content has been demonstrated by previous studies [Laurens, 2001 ; Dérobert et al., 1995]. Two areas were investigated, a damaged one and a healthy one at the intrados of the deck. Half-cell potential measurements were also made to evaluate the probability of corrosion of the reinforcement. The general principle of radar sounding of civil engineering structures, based on the propagation of electromagnetic impulses, has been reported by many authors [Clemena, 1991], [Daniels, 1996]. A radar transmitter (T) stimulates the propagation of several electromagnetic waves (fig. 1). Generally the method is used in reflection mode, where the reflections caused by changes in medium dielectric properties are recorded by the receiver (R). The most common application is the exploration of the signal reflected by the reinforcement (S2 on fig. 1) to provide information on its depth. Another wave is the direct wave (S1 on fig. 1), propagating along the air-material interface in the subsurface with a velocity determined by the upper part of this subsurface [Berktold et al, 1998]. The potential of this wave has not been explored very thoroughly but it is possible to extract EM information from it without any reflector in the material, which is of great interest. The possibilities of using this wave for the evaluation of moisture or chloride content have been shown by previous studies [Soutsos et al, 2001]. Generally, for commercially available coupled antennas, the transmitter and receiver are not dissociated, so the distance between them is always the same. Two antennas are therefore required to make measurements with various distances as for the Common Middle Point (CMP) or Wide Angle Reflection Refraction (WARR) techniques. In this study a single antenna was used, so only the attenuation of the direct wave is analysed. An SIR-2000 GPR system was used in association with a high frequency ground-coupled 1.5 GHz antenna (5100). Both these pieces of equipment were developed by Geophysical Survey System Inc. (GSSI(r)). SIR-2000 is a GPR data acquisition system and the GSSI 1.5 GHz antenna provides high quality waveforms allowing simpler signal processing. The 1.5 GHz central frequency is suitable for low-depth auscultation (20 to 40 cm in concrete), high frequencies being generally more attenuated. 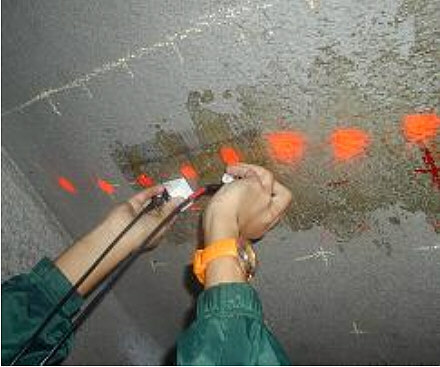 The capacitor technique was mainly developed for measuring the moisture content of concrete in structures. Its principle is to obtain the change in dielectric properties of concrete (with moisture content) between two electrodes from the resonant frequency of an oscillating circuit. e = dielectric constant of the material between the electrodes. Generally, for concrete structures, the electrodes are two parallel metallic plates laid on the concrete which, with the material, form a capacitor the capacitance of which is dependent on the geometry of the electrodes and the dielectric constant of the concrete (fig. 2b). Thus, the resonant frequency is correlated with this special capacitor. Fig 2: a) Scheme of a plane capacitor. b) Scheme of a capacitor for surface NDT. In the case of surface measurements, the volume of investigation and the depth penetration is determined by the electrode geometry and the distance between them. For this arrangement, there is no simple formula giving the capacitance value of the medium investigated. 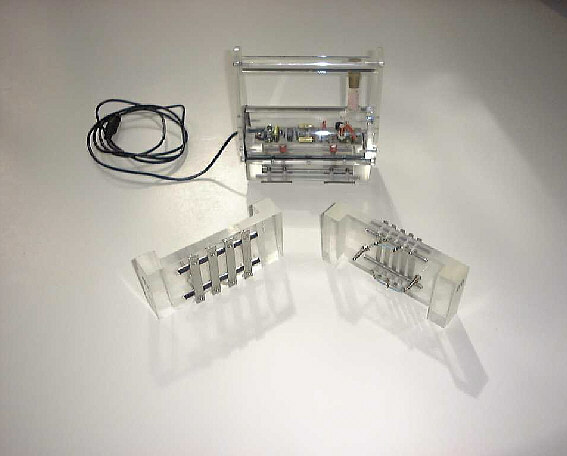 Fig 3: LCPC capacitor prototype with its three electrode kits. Numerous electrodes can be chosen for the capacitor in order to modify the penetration depth. Thus, depending on the kind of electrodes (fig. 3), the investigation can cover from a few millimetres to two or three centimetres. For capacitive measurement, we generally use an electronic circuit delivering an alternating voltage which depends on the capacitance value of the material. This measurement can be made using a simple frequency analyser. In order to minimise the influence of temperature, the oscillator works at around 40 to 65 MHz, but for practical reasons (signal transportation over long distances), the electronic device includes a frequency divider (which lowers the frequency to the 5000 to 40000 Hz range according to the model). In rare cases, some calibration can be done on homogeneous media with controlled moisture content, thus making it possible to obtain the moisture content directly from the frequency measurement. Following a mechanical impact, a surface wave may propagate along the free surface of a solid medium, within a depth around one wavelength. For frequencies ranging from 250kHz to 1MHz, the wavelength is between 2 and 10 mm in concrete. 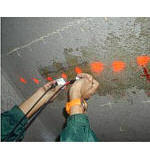 High-frequency surface waves are thus appropriate for inspecting the near-to-surface degraded layer in concrete cover, where aggressive agents can penetrate. Its velocity is expected to decrease and its attenuation to increase with increasing porosity and microcracking. Previous laboratory studies have demonstrated the ability of high frequency surface waves to detect thin distributed damaged areas in mortar [Ould Naffa et al., 2002]. The surface wave is well suited for on site inspection, as only a side access is required. In addition, it is dispersive in multi-layered media, i.e. its velocity depends on frequency. This remarkable property can be used to estimate the elastic property distribution as a function of depth [Matthews et al., 1996]. Pulse velocity is usually measured from the time delay between two or more surface wave signals recorded at different distances from the source. By analyzing the spectral difference between those signals, in amplitude and phase, it is also possible to estimate attenuation and phase velocity. Infrared thermography is a Non-Destructive Testing (NDT) technique that is attractive as a new application to civil engineering structures. Like many NDT techniques, infrared thermography is a non-contact, time-saving and cost-saving method [Clark et al., 2003]. Furthermore, the equipment is often small and handy. For any principle (passive or active) and equipment (radiometer, scanner, infrared camera) [Gaussorgues, 1984] the aim is to obtain a map of infrared radiation as a thermal image with high thermal resolution (better than 0.2°C). The thermal camera (or infrared camera) gives live thermal images of the concrete surface. To analyse the results, images are combined with visual inspections and/or with visual images to accurately determine the location and monitor thermal defects. Every material absorbs and emits energy called thermal radiation. The sensors of the infrared camera measure the luminance which belongs to the infrared part of the electromagnetic spectrum (wavelength of medium infrared l = 2 to 12 mm). The radiometric equation [Sirieix et al., 2003] is used to calculate the temperature of a concrete surface from the luminance. The thermal camera picks up the radiation, which is composed of three parts: radiation emitted by the object, radiation reflected by the object and radiation emitted by the atmosphere between the object and the sensor. Thus the camera computes and shows temperature (fig. 4). Fig 4: Composition of radiation received by the camera. The influence of the ambient temperature and the hypothesis of concrete surface homogeneity (temperature and emissivity considered as constant in time and space) make it difficult to handle absolute numerical values. Consequently it is more convenient to work with temperature contrasts. If concrete is excited by a thermal source (solar radiation or a heater lamp), heat spreads. Defects (delamination, cracks) will slow down this spread. Thus hot spots will be observed in the thermal record. To detect a defect, the temperature contrast must be great enough. Furthermore if the size of the defect is small and the depth is large, heat lines go around the defect which, as a result, cannot be detected [Sakagami et al., 2002]. Empalot Bridge is a 4-span Bow-String bridge built in 1915, over the Garonne river. One of the spans was destroyed during the second war and rebuilt in 1950. This bridge presents several types of degradation but most of them result from corrosion of the reinforcement. Every kind of element is concerned, particularly the strings and the deck intrados. The main results of corrosion are delaminations at the deck intrados and scaling on the beams and the strings. Fig 5: position of the sounded areas at the intrados (view from below). Fig 6: photo of the sounded areas(view from below). The soundings described in this paper were performed on the intrados of an old span. The deck sounded is made up of an old concrete road above a reinforced concrete slab. The thickness of the slab is around 12 cm and the reinforcement is two orthogonal rebar layers spaced every 30 cm. The thickness of the old concrete road is around 12 cm. The present road is made with a bituminous concrete (thickness around 3 cm). The bottom of the deck is coated with a thin mortar layer. Two neighbouring areas of the intrados were surveyed, one very wet and damaged (6) and the other drier and assumed healthy (5), (see fig. 5 and 6). The dimensions of the areas were 1.6 m x 0.8 m.
The investigations were carried out from a truck fitted with a work platform. Radar investigations were made by means of orthogonal profiles spaced every 20 cm. Capacitor measurements were made by means of a 20 cm x 20 cm grid. Some previous studies have shown that the amplitude of the direct wave depends on the water content of the cover concrete [Garciaz et al, 2001], [Laurens et al, 2002]. It has been demonstrated that direct wave amplitude decreases with increasing water content. In this case, the thickness of the concrete above the reinforcement was very small, so there was interference between the direct wave and the reflection on the first layer of reinforcement. Thus, only the first peak amplitude which was not affected by the interference was analysed. Results for the two survey directions are shown in fig. 7. 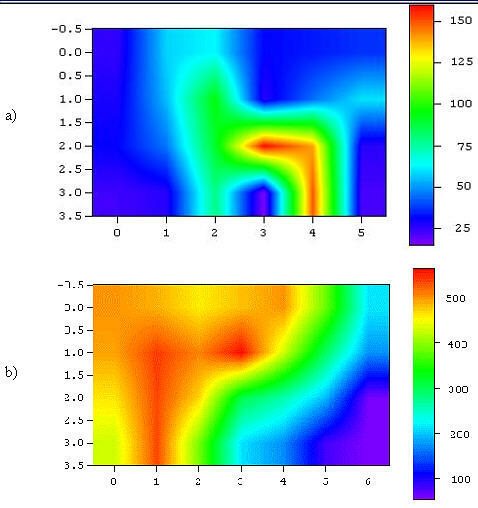 Fig 7: maps of direct-wave radar amplitude on areas A and B a) longitudinal GPR profiles b) transversal GPR profiles. 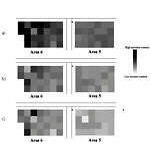 First, and logically, the longitudinal and transversal maps give similar results. The visualisation of the reinforcement can be seen, mainly in Area 6 of fig. 7a. This is because the rebars are very close to the surface (less than two centimeters), which leads to summation of the reflected pulse and direct wave, and so to the slight change in the amplitude measurement. The amplitudes measured on the left part of area 6 are lower than those measured on the right part. These results correlate well with visual inspection which had detected higher water content in this area. Moreover two areas can be clearly discerned (5 and 6) as the amplitudes measured on area 5 are higher. For these experiments, the LCPC capacitor device was used with its three kinds of electrodes, giving different depth penetrations. The major interest of such a possibility is to get an idea of the moisture gradient in the cover concrete. The results are summarized in fig. 8 with a measurement every twenty centimetres. Large electrodes were sensitive to large volume related to a depth of about two or three-centimetres. Medium electrodes were more sensitive to moisture nearer the surface. Concerning the small electrodes, although the elements were more numerous in order to obtain a more realistic averaged value, they remained very dependent on the quality of the surface. For this particular application, the roughness of the cover concrete was such that the small-electrode measurements had to be carefully evaluated. Moreover, the small-electrode results had to be interpreted after viewing the maps obtained with the other two devices (Fig. 8a and 8b). As for the radar amplitude maps, a zone presenting significantly high moisture content can be observed on the left part of Area 6. This logical correlation is due to the fact that these techniques are related to the same physical parameter: the dielectric constant of the concrete. These measurements were made using a Cu/CuSO4 electrode. The grid used was the same as for the capacitor measurements. The map of the results is shown in fig. 9. According to previous results, very high potentials were obtained on area 5, which can be linked to a low probability of corrosion in regard to ASTM criteria [ASTM, 1991]. Fig 8: maps of capacitor measurements on areas A and B a) large electrodes b) medium electrodes c) small electrodes. Fig 9: potential measurements (x-1 mV) a) on area 5 b) on area 6. Fig 10: positioning of surface wave transducer pair along a profile on area 5; the large red dots correspond to successive emitter positions. On the other hand, on area 6, the values were low and so more significant. Particularly, lower potentials were measured on the left part of the area where water content was higher as shown by radar and the capacitor method. Thus in regard to ASTM criteria (potential lower than -350 mV corresponding to a probability of corrosion of 50%) there was a high probability of corrosion in this part of area 6. Some previous studies have shown that radar measurements can correlate well with half-cell potential measurements to detect areas on bridge decks with high probability of corrosion [Laurens et al., 2000]. The apparatus used for surface wave inspection includes: a Panametrics 5058 pulser-receiver, a Tektronik TDS 210 digital oscilloscope connected to a rugged portable PC and a pair of custom-designed surface wave transducer. They are made of a Panametrics compression wave transducer coupled to a solid wedge. The material and angle of the wedge are chosen so as to generate a refracted grazing wave into concrete. Currently, two pairs of transducers are available at 0.5MHz and 1MHz, with approximately 60% bandwidth. Surface waves signals are recorded along successive 10cm segments. The first receiver position is at 5cm from the emitter. After recording the first signal, the receiver is moved 1cm away, up to 5cm. Then, the emitter is moved until its last position. A group of 5 signals is obtained for each emitter position, from which 20 measurements of pulse velocity, attenuation, central frequency and phase velocity are made and averaged. Parameters of the surface wave at 0.5MHz are measured along two 2m profiles, located at the middle of area 5 (assumed healthy) and area 6 (assumed damaged). Velocity profiles for both areas are presented in Fig.11. A profile measured at the intrados of the more recent span is added. 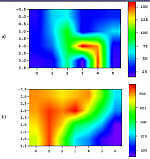 Fig 11: surface wave velocity profiles' ': intrados of newer span, ' ': area 5 of older span, ' ': area 6 of older span. Surface wave velocity is significantly lower on the old span (around 2200 m/s), but no difference is noticed between areas 5 and 6. A similar behavior is observed on attenuation and central frequency profiles. This unexpected result may be due to the presence of a few millimeters thick cement coating. Instead of penetrating concrete, the surface wave is likely to be "trapped" into this coating. 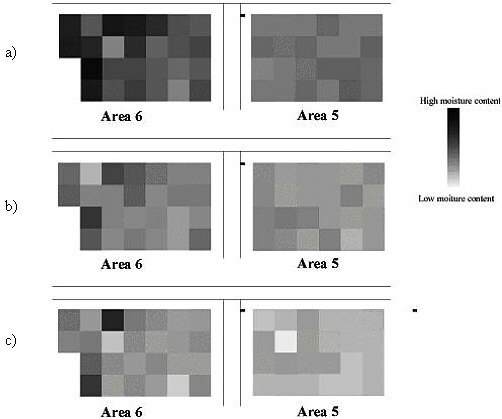 Another factor that may mask the effects of degradation is the higher moisture of area 6, which facilitates ultrasound propagation. With a thermal camera, ThermaCAMTM SC 2000 (FLIR Systems), we investigated the deck intrados. The results presented are related to a different area from those used for the radar and capacitor investigations. Indeed in these areas the sensitivity of the thermal camera was not sufficient to detect the moisture surface gradient. Nevertheless the method allowed two areas to be broadly distinguished. The images presented in fig. 12 and 13 are related to a neighbouring area which presented damage such as cracks and delaminations. Taken at 4.50 m from this object, the size of thermal images is 1.90 x 1.40 m2. We completed this investigation with visual images in order to compare both sets of information. Fig 12: Visual image of structure. Fig 13: Thermal image of the same structure. In this case, we have sub-surface defects (fig. 12). Two transversal cracks were detected on the visual image and the thermal image (fig. 13) but two delaminated areas (IR1 and IR2) were only detected on the thermal image. 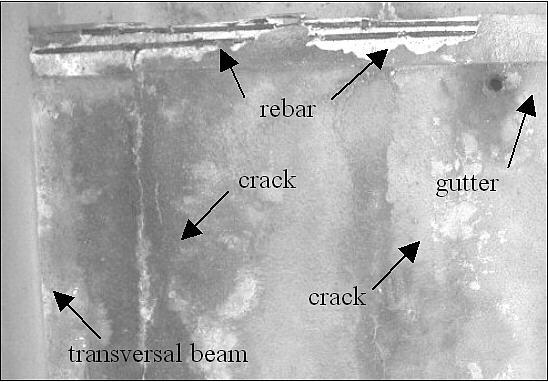 The aim of the study presented in this paper was to explore the potential of combining non-destructive techniques for the assessment of cover concrete integrity. Both mechanical and durability aspects are concerned. At this stage of the work, not all the combinations have been completely investigated as some techniques are still in the development phase [Ammouche et al, 2003]. Their use for in-situ applications has not been fully validated. But the first investigations presented in this paper have enabled the limits of the various techniques to be assessed, which will be very useful for carrying through the sensitivity studies. Also, the results of laboratory experiments lead us to expect good correlations between, for example, the resistivity technique and acoustic surface waves for the evaluation of cover concrete damage. Nevertheless this paper emphasises the first interesting couplings between radar technique, capacitor measurement and half-cell potential method. The scope is the evaluation of moisture contrast within cover concrete which relies on durability aspect and mainly on reinforcement corrosion. It can be concluded that there is an obvious complementarity in using these three non destructive techniques. Results obtained by radar are quasi-continuous along very long profiles, which is very interesting for a global diagnosis. But the data treatment may be longer than for capacitor technique, which can quickly provide very useful data for local calibrations. Moreover, we show that radar or capacitor measurements can provide reliable data for the corrosion diagnosis as there is a good correlation with half-cell potential results. So, the radar technique could be implemented for fast evaluation of corrosion before an assessment with more precise measurements, such as polarisation resistance for example, on critical areas. Once achieved the development for all the techniques, the future investigations should permit to highlight further couplings. The authors gratefully acknowledge "Réseau Génie Civil & Urbain" and Ministry of Research of French Government for their financial support. Clark M. R., McCann D. M., Forde M. C. (2003), " Application of infrared thermography to the non-destructive testing of concrete and masonry bridges ", NDT & E International, In Press. Daniels D.J. (1996), Surface-penetrating radar, Instit. Electrical Engineers, London, UK, 300 pp. Dérobert X., Côte Ph., Lecocq-Levent N. (1995), "Electromagnetic auscultation on brick masonry", 1rst EEGS-ES cong. proc., Turin (IT), sept., pp. 320-323. Gaussorgues G. (1984) "La thermographie infrarouge: principes - techniques - applications", Technique et Documentation, Lavoisier - Paris, 482 p.
Laurens S. (2001), "Aptitude de la technique radar à la caractérisation du béton d'enrobage - Aide au diagnostic de la corrosion des armatures", thèse INSA Toulouse (FR) - Université de Sherbrooke(CA)., 211 pp. Matthews M.C., Hope V.S., Clayton C.R.I. (1996) "The use of surface waves in the determination of ground stiffness profiles" Proc. Instn Civ. Engng 119, pp. 84-95. Ould Naffa S., Goueygou M., Piwakowski B., Buyle-Bodin F. (2002) "Detection of chemical damage in concrete using ultrasound", Ultrasonics 40, pp. 247-251. 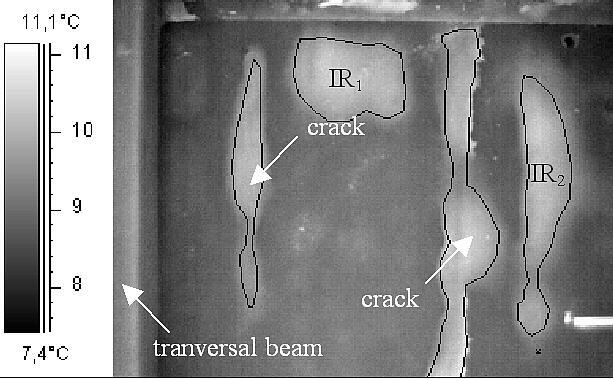 Sakagami T., Kubo S. (2002) "Development of a new non-destructive testing technique for quantitative evaluations of delamination defects in concrete structures based on phase delay measurement using lock-in thermography ", Infrared Physics & Technology, vol. 43, Issues 3-5, p. 311-316. Sirieix C., Defer D. Antzack E. (2003) "Chapitre B.5 : Méthodes END thermiques - Thermographie infrarouge", in Breysse D., Abraham O. (in process) "Méthologie d'évaluation non destructive de l'état d'altération des ouvrages en béton armé ", AFGC-COFREND.